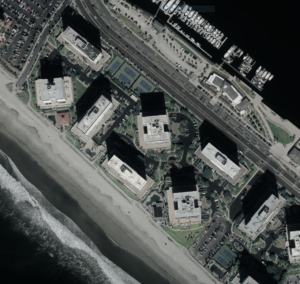 Aerial photo of 1750 Avenida del Mundo in Coronado, California (Imagery available from the U.S. Geological Survey). 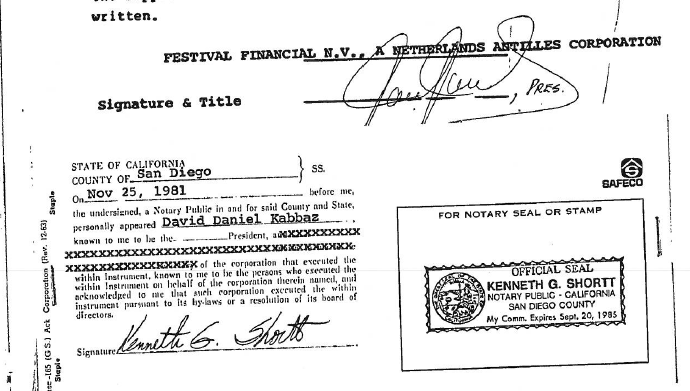 Festival Financial N.V., a Netherlands Antilles corporation, purchased Unit 1410 at 1750 Avenida del Mundo in Coronado, California in August, 1978 for $145,000 (based on the documentary transfer tax paid). Festival Financial N.V. borrowed $111,500 against the condo on August 2, 1978. David Daniel Kabbaz was president of Festival Financial N.V. as of November 25, 1981 according to a declaration he signed on behalf of the company in connection with the condo. Signature of David Daniel Kabbaz in the amendment to supplemental declaration of the Coronado Shores Condominium Association #10. Festival Financial N.V. sold the condo in February 1989 for $240,000 (based on the documentary transfer tax paid). ChedrauiLeaks recently profiled a different condo at the same building that was also linked to David Daniel Kabbaz and Festival Financial NV. David Daniel Kabbaz, who is also known as David Daniel Kabbaz Chiver, is one of the founders of Grupo Danhos. He also serves as the Chairman of the Technical Committee for Fibra Danhos. Jose Antonio Chedraui Obeso serves as an independent director on the Technical Committee for Fibra Danhos and on the audit, nominations, and practices committees. Elvira Daniel Kabbaz Zaga is David’s daughter. Elvira was confirmed on March 31, 2017 as David’s alternate as chairman of the Technical Committee for Fibra Danhos. ChedrauiLeaks.org has noticed that the media in Mexico contains very little information about the business dealings and personal assets in the United States of what could be termed Mexican elites, wealthy business people and politicians. ChedrauiLeaks is not stating that members of the Chedraui family or its businesses had any involvement with Festival Financial N.V. or this condo unit.